1 Fulham’s Craven Cottage is the place to go if you want six-goal thrillers. First a 3-3 draw with Spurs, a couple of weekends ago, and then another six-goal fest against Sven’s Man City this weekend. 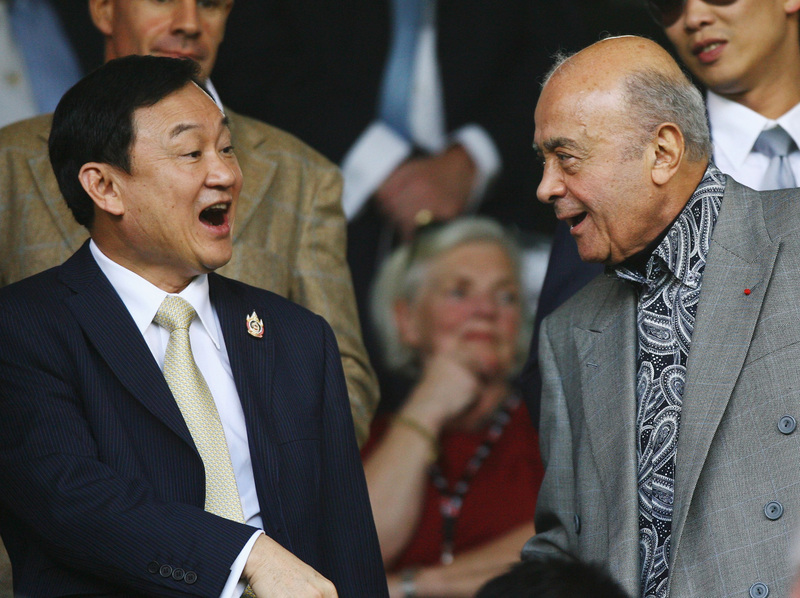 Thaksin Shinawatra and Mo Al-Fayed (pictured) seemed to enjoy it anyway. 2 Avram Grant won’t be Chelsea manager come the end of the season. Although his team performed decently at Old Trafford, he already looks beleaguered. 3 Bolton’s draw with Tottenham probably saved the skin of both Sammy Lee and Martin Jol, although both men are still living on borrowed time. 4 Emmanuel Adebayor – what’s happened to him? Um, I know – if I draft him into my fantasy team, that will scupper his fine formâ€¦ seemed to work for Robin van Persie anyway. 5 As a Spurs fan, I would love nothing more than to see the staggeringly good Cesc Fabregas â€“ I think I’m a little bit obsessed with him â€“ sign for Barcelona, just to see him team up with Lionel Messi. What a partnership that would be. Because, let’s face it, Cesc’s never going to sign for Spurs. 6 Charles N’Zogbia’s conversion from marauding midfielder to marauding left-back seems to have worked wonders. He was terrific in Newcastle’s convincing win against West Ham. 7 Arsenal may be top of the league, but have they had any really tough fixtures yet? Answer: no, they haven’t. Spurs away was their biggest hurdle so far, which says it all. I’ve said it before and I’ll say it again – the Gunners won’t win the league this season. 8 Yet another story featuring Michael Owen and ‘injury scare’ in the same sentence. Yawn. 9 Yet another crap refereeing decision marring a big game â€“ Jon Obi-Wan Mikel shouldn’t have been sent off at Old Trafford. Not to mention that Carlos Tevez scored in added time that shouldn’t have been added by Mike Dean. 10 ‘We are getting better,’ says Derby boss Billy Davies after his side’s 5-0 defeat at Arsenal. If New Labour are looking for another spin doctor down Millbank way, Billy’s the man. Actually, our toughest fixture was Blackburn away. You see, Sp*rs are a wee bit shite to be considered tough opposition. Well, Arsenal are the richest club in England now…how about we buy Messi and team him up with Cesc in London?